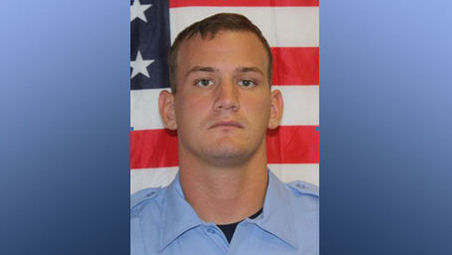 MONTGOMERY COUNTY, Texas -- A Houston firefighter returning home from a night of St. Patrick's Day partying was shot and killed by his next-door neighbor when he tried to enter the wrong house, CBS affiliate KHOU reported Tuesday. Sam Keen, 27, was shot Monday night by a 64-year-old woman who thought he was in intruder, Montgomery County sheriff's deputies said. Houston Mayor Annise Parker told KHOU that Keen took a cab home after a night of drinking to celebrate St. Patrick's Day. He was asked to leave the bar so his friends put him in a cab, the station said. "No one did anything wrong. It was just a confluence of events that provoked a tragedy," 0Parker said. "My understanding is that the firefighter, off-duty, had been out. He did what he was supposed to do: He took a cab ride home, got dropped off in the wrong place and wasn't aware of it. [He] tried to get into what he thought was his house and was tragically shot." Deputies said the woman heard something on her front porch around 9:30 p.m. Monday. She looked out and saw a young man outside. She said she yelled for the man to leave, warning him that she had a gun. The woman told deputies the man kept trying to get into her home so she fired two shots through the door and then called 911. Keen was rushed to a Houston hospital where he later died. Keen and his wife were newlyweds who moved to the neighborhood about a year ago. "We're here to support her and do whatever we can to kind of help them through this process," said Houston Fire Department Chief Terry Garrison. "But it's a travesty. Whether we lose a firefighter on duty or off-duty, we lose a member of our family." Keen joined department in 2010. Fire stations across Houston lowered flags to half-staff Tuesday. Keen also served in the Marines, according to his Facebook site. The woman who shot him was not physically hurt but was shaken up. Deputies said she was home alone at the time. "If someone is coming through your door and trying to get in, I could see where she was scared," neighbor Kathy Pimms told KHOU. "She's a good woman," said neighbor George Henry. "I known her about five years. She's a very nice person." As is standard policy, the shooting will be sent to a grand jury to determine whether any charges will be filed, officials said.